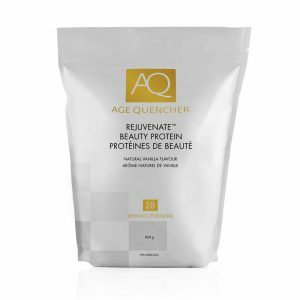 Age Quencher was sparked by a leading Canadian Naturopathic Doctor when she received a simple but powerful question from a young woman whose cancer treatment had lead to early menopause. SIX PRODUCTS IN ONE, REJUVENATE™ is infused with 3300mg of Marine Collagen and Silica to promote skin elasticity, healthy aging, lustrous hair and manicure worthy nails. Perfectly blended to support joint health while decreasing inflammation in the body. REJUVENATE™ supports digestive and immune health via added fibre and a full spectrum probiotic. Promotes healthy weight management. Naturally vanilla flavoured boasting 20 grams of protein per scoop with under 2 grams of carbs per serving. 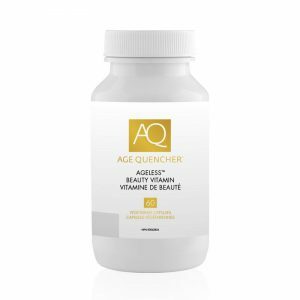 The AGELESS™ Beauty Vitamin is an innovative formula that combines the powerful properties of essential vitamins and antioxidants to help combat the signs of aging. AGELESS™ promotes beauty and wellness from the inside out and comes in an easy to swallow veggie capsule. Additional support and Protection for Heart, Brain and Internal Health. Are you lethargic, foggy or lacking motivation? Do you drink caffeine or alcohol? Is your skin dull and tired looking? Water alone is sometimes not enough. Many of us are dehydrated and do not even know it. Dehydration is the NUMBER ONE cause of premature aging of your skin! HYDRATE™ provides intense hydration to every cell in your body and is infused with essential minerals, electrolytes and antioxidants. As we age, our nutritional needs and need for water changes. Often the sensation of thirst is decreased by hormone changes, menopause, health issues or medications leading to an increased risk of dehydration. 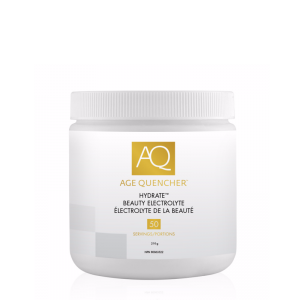 HYDRATE™ helps to replenish vital electrolytes while promoting radiant, glowing skin. A cleaner solution for hydration that quenches your thirst and tastes delicious.